Protected in secret for years, some of the world’s most precious ancient artwork is now at the Tokyo National Museum. Mr. Inoue, thank you for this interview with Tokyo Art Beat. Could you please tell us about your role in “Hidden Treasures from the National Museum, Kabul”? Thank you for your interest in the exhibition. I am Chief Curator of the exhibition, as well as Director of the Curatorial Planning Department of the Tokyo National Museum. These Silk Road treasures have not only survived the ravages of war and time, they are viewable now thanks to those who risked their lives to rescue them from the war-devastated National Museum, Kabul, hiding them in the vaults of Afghanistan’s Central Bank from 1989 until 2004. What do you know about how decisions of what to save were made? As far as I know, the decisions were made based on the historical and cultural values of the objects. 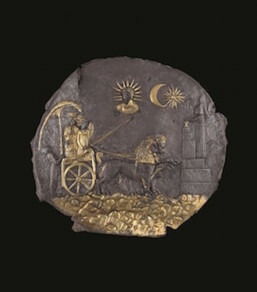 The National Museum, Kabul once held more than 100,000 Islamic and pre-Islamic objects, including the archeologically significant gold jewelry of the Bactrian Hoard, some of which is shown here. Still, a large part of the collection is gone forever. How does a curator cope with losing so much history and culture, and how has the National Museum, Kabul moved forward to restore its legacy? Has its understanding or representation of its cultural heritage changed? Each curator understood very well the importance of those treasures. In order to restore the museum’s legacy, they felt strongly about their mission to convey the importance of their own culture to future generations. Such feeling about the mission never changed and even became stronger, I think. This exhibition is on a ten-country tour and has been seen by 1.7 million people. What is unique about the Tokyo National Museum show? Chapter Five in the Tokyo exhibition is “Displaced Cultural Properties from Afghanistan,” showing 15 Displaced Cultural Properties protected in Japan. These are cultural properties illegally taken from their original locations in Afghanistan. What can you tell us about these 15 Displaced Cultural Properties and their journeys? 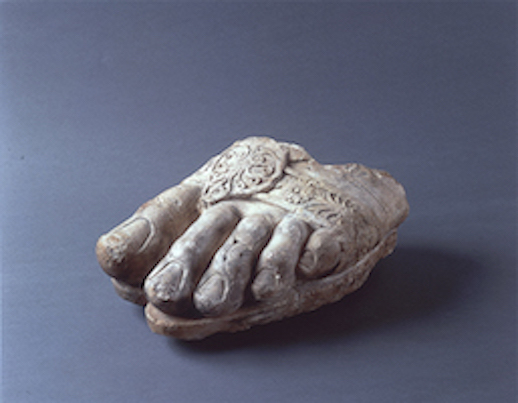 They include objects that were exhibited at the National Museum, Kabul, such as Left Foot of Zeus and Buddha Worshipped by Kasyapa Brothers. By being protected in Japan, at least their journey was stopped and further dispersal of these cultural assets was avoided. It is important that these once-lost objects were protected in stable conditions in Japan, making it possible to return them to Afghanistan in the future so that the Afghan people would be reunited with their cultural properties. The late Japanese artist Ikuo Hirayama, a painter of Silk Road scenes, was instrumental in bringing the Displaced Cultural Properties to Japan. How did he get involved, and what was his role? Professor Hirayama loved Afghanistan very much and visited the country six times. He thought deeply of the country and its culture. He was also a UNESCO Ambassador. He regarded the Afghan cultural properties brought to Japan as “cultural refugees” and established the Japan Committee for the Protection of Displaced Cultural Properties. He was the chairman of the committee. I’ve read there were difficulties in bringing this exhibition to Japan. Could you talk about them and how they were overcome? Besides financial matters, negotiation with the Afghanistan side was not easy without confirmation of the next venue. It was not possible to return the Displaced Cultural Properties directly to Afghanistan, so confirmation of the next venue was indispensable to hold this exhibition. There are two good examples that demonstrate this: Cybele Plaque features Cybele, who is a local goddess of Anatolia, Greek gods and goddesses, and a Western Asian figure in one plaque. Applique of Aphrodite represents a figure of a Greek goddess with some local elements (her physical traits, wings, and the dot on her forehead are obviously not Greek). The works date from 2100 B.C. to 2nd century A.D and come from four main sites in Afghanistan: Teppe Fullol, Ai Khanum, Tillya Tepe, and Begram. What is distinct about each of these places, and what do their objects tell us about the lifestyles, and beliefs of their civilizations? Tepe Fullol: A Bronze Age site dating back to 2100-2000 BC. This region is close to Badakhshan, a production area for lapis lazuli, an important object of trade in the ancient world. The designs on gold and silver vessels from this site show connections with Mesopotamian civilization to the west and Indus civilization to the south. Aï Khanum: A colony created by Greeks who spread eastwards after the eastern expedition of Alexander the Great in the 4th century BC. The excavated materials reveal the colony’s cosmopolitan character. 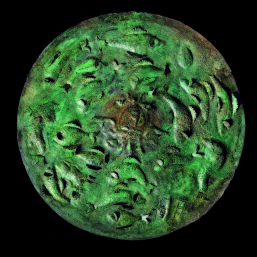 Persian styles can be seen in the artifacts, such as a decorative disk from India. In 1971, the then Crown Prince and Crown Princess of Japan (the present Emperor and Empress of Japan) inspected Aï Khanum during their visit to Afghanistan. Tilliya Tape: A Bactrian burial site for nomads, dating from the 1st century BC to the 1st century AD. The six tombs excavated here were for five women and one man. 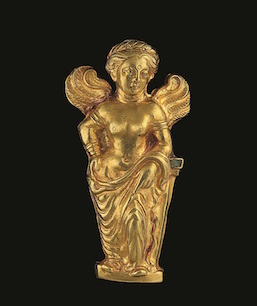 The numerous golden burial accessories are a highlight of this exhibition. Some mirrors from China’s Western Han dynasty (not included in this exhibition) and an ivory object from India indicate that the whole find contains an intermingling of various cultures. Begram: The site of an ancient city located northeast of Kabul. It was the summer capital of the Kushan dynasty, which ruled an area from northern India to parts of Central Asia in the 1st to 3rd century. A large number of artifacts were excavated from two sealed-off rooms within the city. The excavated objects include brightly colored Roman glass cups, statues of Greek and Roman deities that were syncretized with Egyptian gods, ivory furniture decorations with reliefs showing Indian women, and Han Chinese lacquerware. The items tell us how these people who lived in ancient times were connected to the world via the Silk Road and how they enjoyed the world’s riches. 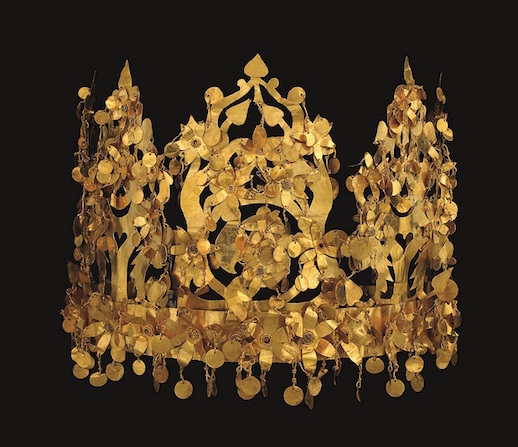 What is remarkable about the 1st century gold crown from Tillya Tepe, especially as it pertains to Japan? What other works have parallels to Japanese history and culture? The upper parts, the ornaments in the shape of a tree, are removable from the lower band of the crown. It was portable and thus convenient for nomadic life. There is a gilt bronze crown excavated from the Fujinoki Kofun burial mound in Nara prefecture, Japan. This crown looks very similar to the Tillya Tepe crown. Both crowns are characterized by their tree-like ornamentation with bird motifs. The tree-crown possibly symbolizes the tree of life or a “sacred tree,” while birds often have sacred characteristics. Those motifs as a whole symbolize fertility and reincarnation, and the Sun and an eternal nation, and are used for ornamentation of crowns. The motto of the National Museum, Kabul and this exhibition is “A Nation Stays Alive When Its Culture Stays Alive.” How do you think arts and culture can contribute to a nation’s survival (or revival)? A nation is supported by its people, and arts and culture can contribute to enriching their spirits. In order for a nation to survive or be revived, people need something they can rely on mentally. That would be the culture of the nation. Such “soft power” is indispensable for the survival or revival of a nation. What works would you select from the Tokyo National Museum to represent or preserve Japan’s cultural and national history? I would select Pine Trees by Hasegawa Tohaku and Wind God and Thunder God by Ogata Korin. Both represent Japanese traditional culture with paper well. Pine Trees conveys tranquility, one of the characteristics of Japanese art and culture, by its airy depiction of the space and the trees. The Wind God and Thunder God have both been depicted in Japanese art works since ancient times. These gods may be traced back to Central Asian and even further to the West, to Greek Gods. What is the current state of National Museum, Kabul? What will happen to these treasures after their world tour ends? The exterior of the museum has been restored and some of the exhibition spaces have been opened to the public. The objects exhibited at the Tokyo exhibition will travel to the next venue. At this point, we don’t know when the tour will end. 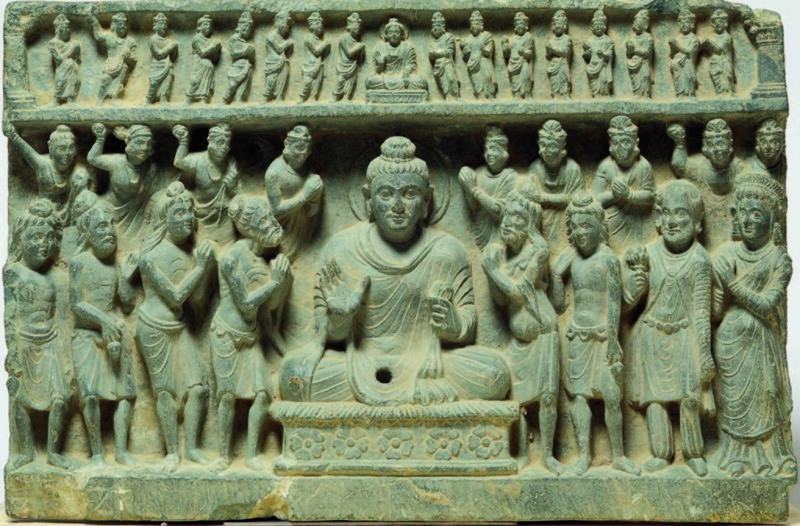 What lessons do the exhibition, these works, and the story of the National Museum, Kabul have for Japan? For the world as a whole? This exhibition conveys a message from the Afghan people who risked their lives to protect their cultural properties. The message is not just for Japanese people, but for people across the world. The exhibition and exhibits let us consider why we need to preserve cultural properties, and this is about the importance of culture. By considering such an issue, we may also think about our contemporary society. Cultural properties are the materials that inform people about the importance of culture for human beings, and thus we need to preserve and to pass them on to future generations. We must preserve cultural properties so that we can have a foundation in the future. The Afghan people recognized their mission to preserve their own culture for future generations, and protected those cultural properties, including those in the current exhibition.